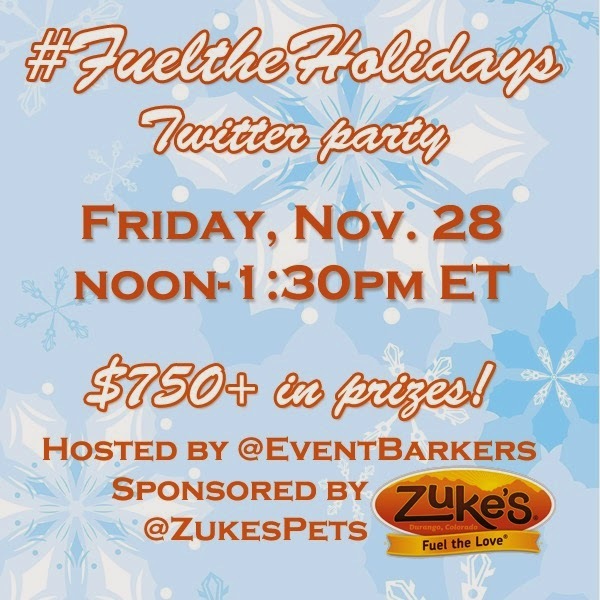 To Dog With Love: RSVP for #FueltheHolidays Twitter Party with Zuke's! RSVP for #FueltheHolidays Twitter Party with Zuke's! Just in time for the holidays, we're excited to bring you our next Event Barkers Twitter party! Along with Zuke's, we'll be celebrating at the #FueltheHolidays Twitter party on November 28. The fun begins on Black Friday, the day after Thanksgiving. And if you're like us, you'd much rather be chatting with your dog-loving friends and winning fabulous prizes than fighting the crowds at the malls! We'll be giving away more than $750 in prizes featuring USA-made Zuke's treats created with wholesome wholefood ingredients. And we'll also be chatting about great ways to keep your pup happy during the hectic holiday season, which can be a stressful time for many of our dogs. As always, get ready to share your cute pup photos with us, bring your questions and join us for 90 minutes of fun on November 28. Here's a look at the more than $750 in prizes we'll be giving away at #FueltheHolidays. And, in the spirit of giving this holiday season, each of our winners will receive a nice variety of Zuke's treats for their dogs AND plenty extra to give as great gifts to their favorite dog lovers! Each prize pack contains $70+ in Zuke’s treats (and even more for the grand prize). Party winners: Eight party winners will each win eight packs of Zuke’s treats! To enter the party giveaways, you just have to use the #FueltheHolidays hashtag and be active on the party. Grand prize winner: The lucky grand prize winner will receive a grand total of 14 bags of treats! Mini Naturals These miniature, semi-moist treats have only three calories each, making them an ideal choice for rewarding your dog; flavors include Peanut Butter, Salmon, Wild Rabbit, Chicken, Duck and Roasted Pork. Z-Filets This tasty favorite is made with pure USA chicken or beef, or New Zealand Venison, and antioxidant-rich herbs. Lil’ Links This high-value treat for dogs who love meaty goodness delivers natural, grain-free, antioxidant-rich ingredients. Lil’ Links are made with 100 percent real meat and contain no meat by-product. Meat is the first ingredient found in the treats, and is supplemented by natural ingredients including apples, potatoes and carrots, and seasoned with antioxidant-rich herbs. Genuine Jerky Made with 100 percent grass-fed New Zealand beef, this high-value treat is naturally preserved without nitrates or nitrites. Z-Bones Everyone wants good breath for holiday company, and that can include your dog with these natural dental breath fresheners. Made without wheat gluten, cornstarch or synthetic chlorophyll, these potato-based chews maintain dental hygiene by scraping and polishing your dog’s teeth as he chews. Please RSVP and enter the pre-party giveaway in the widget below. There are many ways to enter but you can enter with as many or as few entry methods as you choose! Get started by simply entering your email address and name in the widget below. Good luck! What a fun giveaway! Guido's Favorite Foods is the nearest retailer to me. I'll have to go check them out! I love your twitter parties with Event Bakers. My closest store with Zukes is Petsense In Goose Creek but I prefer Petsmart in Summerville. Question: I may have to miss this twitter party cause of the holidays I hope not but if I do am I still eligible for any prizes? Yes! If you enter our giveaway via the giveaway widget at the bottom of this post, you'll still be eligible to win a pre-party prize whether you attend the party or not! Still, hope you can make it... even if it's for a little bit. Should be a lot of fun! The Giveaway tools where you RSVP says the party is Jun 22 at 8-9pm??? Thanks for letting us know... we'll check on that and correct it! The party IS November 28. Hope to see you there! The closest place is U Dirty Dog in Spearfish Sd. Pet Smart in Washington,Mo is my closest store and that is still one hour from where I live, which happens to be wayyyy out in the country. Petco and Petsmart are equidistant from me and both carry Zuke's Treats. Our closet store is Petsmart in Columbus, OH! Petco and Pet Club are the closest to me!! Our closest retailer is PetsuperMarket.